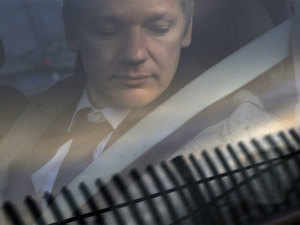 Business News›News›International›World News›Looking for America - Is Julian Assange heading to the United States? LONDON - British police dragged Julian Assange from the Ecuadorean embassy last Thursday after his asylum was revoked, ending his seven-year stay there and opening the way for his extradition to the United States. That investigation was later dropped but because he had breached his British bail in 2012, he was arrested last week and found guilty of failing to surrender to Westminster Magistrates' Court. Westminster Magistrates' Court's Judge Michael Snow said Assange faces up to 12 months in jail when he is sentenced at a later date at Southwark Crown Court. The British criminal action against Assange will take precedence over extradition proceedings although Nick Vamos, lawyer at London-based firm Peters & Peters and former head of extradition at Britain's Crown Prosecution Service, said in practice it would make little difference. "Even if he gets a maximum 12-month sentence, that means he will serve six and it will take at least six months for his extradition proceedings to be resolved," Vamos told Reuters. "Even though technically it would be a re-issued request, in effect it would be just a repeat of the request that was issued many years ago and therefore it would be treated as if it was the earliest one," he said. "We don't know what happened in Sweden, we don't whether he committed that offence and there's a victim there who's been waiting for justice for many years and I think that should take priority." Just hours after Assange's arrest, U.S. prosecutors announced charges against him for conspiring with former Army intelligence analyst Chelsea Manning to gain access to a government computer. Manning was convicted by court-martial in 2013 of espionage and other offences for furnishing more than 700,000 documents, videos, diplomatic cables and battlefield accounts to WikiLeaks while she was an intelligence analyst in Iraq. Former President Barack Obama commuted the final 28 years of Manning's 35-year sentence. "Everybody can challenge an extradition request on the basis it would be contrary to their human rights for them to be extradited," Vamos said. "So Assange could argue that it would be impossible for him to have a fair trial in the U.S. given what happened to Chelsea Manning, given the notoriety, the publicity about his case that effectively he's been tried in the media, public statements by U.S. officials (that) it's impossible for him to have a fair trial." "He could argue the entire request is politically motivated that he is being prosecuted by reason of his political opinions or his political affiliations, that it's revenge, it's vindictive, it's a vendetta," Vamos said. "All of those arguments have legs." Sweden's original request for Assange's extradition went to Britain's Supreme Court which backed the request. If a lower court orders his extradition, then he could again appeal the decision to London's High Court and ultimately again to the Supreme Court if he can identify a challenge based on a point of law. For U.S. requests, the courts' decision has to be ratified by the Home Secretary but Vamos said in effect this was now just a rubber-stamping exercise.